The Patristics Theology adult education class resumes Tuesday nights 6:30-8:30 starting June 12th. The next Ancient Healing Service is 2 weeks away, June 13th. Notify your friends, co-workers, etc. Father Sid extends his gratitude to those who routinely assist the parish with volunteer help. For instance, those who clean up after church socials, flowers, bakers/wrappers, market sellers, landscaping, food pantry donors, maintenance, workday attendees, etc. Although this list certainly is not complete be sure that your help, regardless of its perceived importance or high/low profile, is greatly appreciated. God grant all our volunteers (parishioners and no-parishioners) peace, health and happiness for many years! 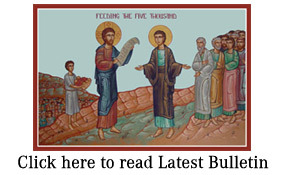 – The 2011/2012 Stewardship Campaign is drawing to a close. All pledges and final payments are due by June 20, 2012. For further information, please contact Fran Makuh at 216-741-8773, ext. 221. – The Office of Youth Protection’s Victim Assistance Coordinator, Dr. Sharon DiLauro Petrus can be reached at 216-741-8773, ext 346. – For information regarding the girls’ Life in Christ or boys’ Alive in Christ weekends, please contact Fr. Dennis Hrubiak at 216-741-8773, ext. 232.